There are few plants that offer their blooms in the dead of winter, but this is one that does, and announces its presence with a hauntingly sweet scent. 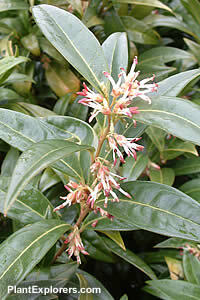 This dwarf evergreen shrub spreads by suckers and produces small white fragrant flowers in late winter, followed by blue-black fruit. Height 18 inches; spread 3 feet. For maximum freshness, please keep seed refrigerated in its original packaging until it is time to plant. Sow seed in containers in spring. Maintain even, but not excessive, moisture. Grow on in any good garden soil. Hardy to -15°Celsius (5°F), although the leaves may be severely damaged by exposure to sun during freezing weather.